This is my final of three reviews for the ‘Outer Space on Film’ Blogathon being run by Debra over at Moon in Gemini. Brief Synopsis – An astronaut is accident left for dead on Mars and must find a way to survive until he can be rescued. My Take on it – This is such an amazing film and they do a wonderful job of creating a modern day version of Robinson Crusoe having to deal with being stranded on Mars. Mat Damon is superb in the title role of this film and proves that he can hold a movie all by himself since he spends almost the entire film alone in every scene that he appears in. They do a great job of keeping a balance between the various locations of the characters as they all try to find a way to save Damon’s character. This story is in general a very serious and dire drama, yet they manage to constantly pepper in bits of humorous situations in order to keep it feeling a bit “light” despite the fact that we are dealing with a potential disaster. The realism of the film shines through throughout and this is definitely a story that could conceivably be real in the coming decades which makes it even better to watch unfold. The cast is amazing and It always surprises me how many famous actors have supporting parts here. The music used in the film helps the pacing of the film especially when they need to show the passage of time since this story takes place over a number of years. Really loved the way that this film keeps the technical and scientific jargon to a minimum while still keeping the story understandable even for the non scientist. This is one of the best films of 2015 and deserved to win the Golden Globe for Best Picture and Best Actor… unfortunately, they somehow won in the wrong category of musical/comedy instead of drama. Bottom Line – Amazing modern-day Robinson Crusoe story. Damon is superb in the title role and is able to easily carry all of his lone scenes very well. They give us a great balance between the various storylines as everyone tries to find a way to save the main character. The story is able to take such a desperate situation and pepper in humorous scenes in order to keep things from become too dire. The cast is amazing and I’m surprised that they were able to get so many famous actors in relatively small parts. The music works really well in this film and it helps with the pacing of a storyline that goes on for years. Loved the way that they keep the technical and scientific jargon to a minimum while still making the storyline understandable for the non scientist. One of the best films of 2015. Highly Highly Recommended! 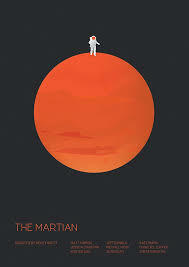 I love stories about Mars but somehow haven’t get seen this one. Your review is going to rectify that! Thanks for writing about if for the blogathon!